A version of this article appeared in the November 2017 issue of Morningstar ETFInvestor. 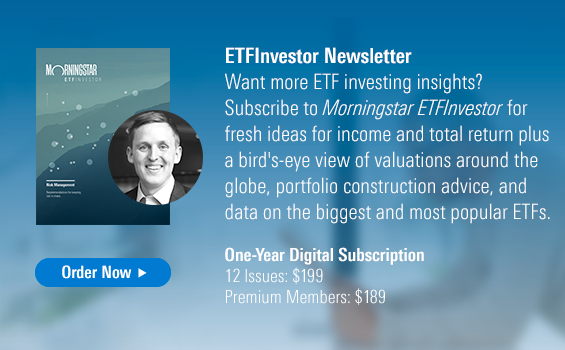 Download a complimentary copy of Morningstar ETFInvestor by visiting the website. “It’s good to learn from your mistakes. It’s better to learn from other people’s mistakes." Investors spend a massive amount of time trying to make all the right moves. The collective effort dedicated to picking good stocks, managers, exchange-traded funds, and so on, is immense. There are countless books, magazines, newsletters, podcasts, blogs, television programs, and more dedicated to helping investors make the best possible decisions when it comes to selecting and managing investments. Far less energy and commentary is committed to the topic of how not to make the wrong moves. Here, I’ll discuss three common mistakes, all of which I’ve made (and will continue to make) myself. The three are related in that they are all behavioral issues that have been hard-wired into us over centuries. I’ll also share the potential consequences of these behav­ioral blunders and how you might be able to avoid them. Countless factors drive global markets. Randomness rules, so predicting how these myriad variables will influence securities’ prices is impossible. Thinking otherwise is foolish. Deep down, we all know this, but we prognosticate nonetheless. What’s more, we have a tendency to think that we not only know how the future will take shape, but that we have some part in shaping it. Investors cannot control the path of interest rates, increases in productivity, the level of Amazon.com’s (AMZN) stock price, and so on, but we often act as though we can. The illusion of control is pervasive. It is in some ways a form of self-preservation, and it’s been linked to positive mental health. But as inves­tors, it can be hazardous to our wealth. The illusion of control can lead to overconfidence. Overconfidence can lead to overtrading. Overtrading will almost inevitably leave you short of meeting your goals. While I could go on forever enumerating the things that we cannot influence, the list of those things we can control as investors is much shorter. The most meaningful levers we can pull to affect our investment outcomes are as follows. 1. Save. Sock away as much as you can. This is the investor’s equivalent of advising you to eat dark green leafy vegetables. We know it’s good for us, but we’d like it better on a pizza. The earlier we begin saving, the better, as it buys us more time for the magic of compounding to work in our favor. 3. Allocate your assets appropriately. Asset-allo­cation matters, though it’s a distant second to simply being invested in the market. How you allocate your assets depends on your goals, your time horizon, and your willingness and ability to assume risk, among other things. Having an appropriate mix of stocks, bonds, and cash will do more to move the needle than trying to pick the best securities or managers you can find. 4. Minimize costs. Fees, commissions, taxes—every penny spent covering these costs is a penny that will not compound over time to be savored down the road. So spend every penny wisely. 5. Avoid taxes. Please note that I did not write “evade taxes.” While we can’t control tax policy, we can respond to it. Locating less tax-efficient assets (closed-end funds, for example) in tax-deferred accounts and investing in relatively tax-efficient vehi­cles (such as equity ETFs) in taxable accounts can help you avoid putting any more pennies into Uncle Sam’s pocket than you have to. There are countless things investors cannot control, but we often kid ourselves into thinking we can. Avoid overconfidence by keeping this short list nearby. Give it a look the next time you think you know what the launch of the iPhone X will do for Apple’s (AAPL) stock price. Recency bias describes our tendency to extrapolate our recent experience into the future. When my three-year old throws a tantrum, I tend to picture her as a grown woman kicking and screaming on the floor, even though I’m confident she’ll become a well-adjusted adult. Investors do the same. Stocks have been marching higher for the better part of a decade, so surely they’ll only continue to climb...right? Recency bias can become particularly dangerous in bear markets. Falling stock prices can lead to panic selling, and shellshocked investors can be slow to get back in once markets rebound. There’s plenty of evidence that the psychological effects of the global financial crisis linger with investors to this day, as many of them have remained on the sidelines for much of the ensuing recovery. Remember, whether or not you are invested is the most painfully obvious determinant of your outcomes. Sitting out on a nearly decade-long rally has been a serious setback for many. One of the bigger investment mistakes I’ve ever made can be partly attributed to recency bias. In February 2009, I bought shares of the paint, coatings, and chemicals manufacturer PPG Industries (PPG). The market was near its nadir, and this was a highly cash-generative company that had consistently raised its dividend for decades, was in good financial health, but was clearly going through a rough patch (what wasn’t?). I saw this as an once-in-a-lifetime buying opportunity and acted on it. One month later, I sold my shares. At the time, it seemed like the world was ending, I’d made a few bucks as the stock had bounced back, but it seemed to me at the time that the market—and maybe even the global economy—had more pain in store. Recency bias got the best of me. What began as a contrarian move by value-oriented me turned out to be a costly mistake. From the time I bought PPG shares on Feb. 20, 2009, to the end of October 2017, the stock returned 27.6% annualized. Meanwhile, SPDR S&P 500 ETF (SPY) gained about 17% annually during that same span. Having sold in March 2009, I missed out on virtually all of that recovery. My opportunity cost was greater still, as my recency bias led me to leave the proceeds of that sale in cash for years afterward. How can we try to control recency bias? The first step is to recognize that it exists (in 2009, I wasn’t familiar with the concept). But that alone isn’t enough. Inevitably, we will be lured by the siren song of “This time is different.” It’s true that every zig and zag in the market is driven by distinct factors from the zigs and zags that preceded it. So, yes, technically speaking, every time is different. But what’s also true is that the long-term trend in markets has been positive for more than a century. Markets grow as economies grow as corporate earnings grow. This trend has persisted through countless crises. So if there’s any good way to avoid recency bias, I’d suggest that it would be to periodically look at the arc of the markets during the past 100-plus years as a reminder that every time is different, but the markets are still driven by the same fundamentals. Our most meaningful investment milestones are decades away, but our attention is monopolized by the moment. Paying too much attention to our invest­ments today can put us at risk of missing goals that are years away. One of the chief side effects of monitoring our invest­ments too closely is that it fuels our aversion to loss. Loss-aversion is but one suitcase among our abundant evolutionary baggage. The theory is that we feel far greater pain from losses than we experience pleasure from gains of equal magnitude. The tie to evolution is that Fred Flintstone had far greater incentive to avoid being mauled by a saber-toothed tiger than to order another oversize rack of ribs from his already-toppled car. Loss aversion can have a meaningful impact on investor behavior. In “Myopic Loss Aversion and the Equity Premium Puzzle,”  Shlomo Benartzi and Richard Thaler demonstrated that the disconnect between the duration of investor’s goals (retiring 30 years from now, for example) and the frequency with which they monitor their portfolios (typically at least once a year) leads to a behavior they coined “myopic loss aversion.” The likelihood of losses in any given one-year period is far greater than the probability of losing money over a longer horizon. But the authors found that annual reviews led investors to behave as if their investment horizon was a year out and not 10 or 20 or 30. This leads many to take less risk (by allocating less to stocks, for example) than is necessary to meet their longer-dated goals. The best way to shake this behavior is to simply stop paying so much attention to the markets and our portfolios. I am a firm believer in an approach to port­folio monitoring and maintenance that borders on benign neglect. There is so much noise in the markets that the signal typically fades into the background. Tuning out the noise will also help to diminish the illu­sion of control and recency bias. In recent years, I personally have made a habit of only looking at my own investments once every few months or so. I’ve found that every time I turn up the volume knob on the market’s noise-making apparatus, it’s tempted me to tinker with my portfolio. While it’s tough to put the market on mute, I think we’d all be better served by tuning out a bit more often. We spend a huge amount of time trying to make smart decisions with our money. I think its possible that we could add just as much value—if not more—by avoiding dumb ones. The most costly errors we make as investors tend to be mental ones. Being aware of our biases is an important first step in preventing these errors. But awareness alone will not suffice. By focusing on the handful of things that we can control, keeping our eyes trained on our long-term objectives, and tuning out the noise in the market, we can boost our odds of building and sticking to a plan that will help us to meet our goals. Presson, P., & Benassi, V. 1996. “Illusion of control: A meta-analytic review.” Journal of Social Behavior & Personality, Vol. 11, No. 3. Kahneman, D., & Tversky, A. 1992. “Advances in prospect theory: Cumulative representation of uncertainty.” Journal of Risk and Uncertainty, Vol. 5, No. 4, P. 297. //doi:10.1007/BF00122574.